on the terrific set of In the Daylight. Add a little dismembering to dysfunction with a sprinkling of laugh-out-loud humor and you get In the Daylight, Tony Glazer’s surprising new play being presented Off-Broadway by Choice Theatricals in association with Vital Theatre Company. The play is surprising because you can’t help but like it, despite the too-often used dysfunctional family plot and some hokey plot twists. The charm comes from Glazer’s one-line zingers and the creation of a mother-from-hell character that makes Medea almost seem preferable. The action takes place on Christopher Barreca’s terrifically stark, jagged and sharply angled set that embodies the maladjusted family as well as their descent into an abyss of madness. A single funereal urn on a pedestal down stage left adds the only color to the all-white, hard plastic-like setting. Famous writer Martin Feingold (Joseph Urla) finally has returned home six years after his father’s death to deal with the ashes and to face his mother, Elizabeth (Concetta Tomei), whom he thinks is dying, and sister, Jessica (Sharon Maguire) who feels he has abandoned her to deal with all of the hard work of looking after their mother and their father’s medical finance business. An added wrinkle is that Martin’s latest best seller, “True Blue,” accused Jessica and Elizabeth, if subtly, of murdering his father William (Jay Patterson), whose spirit still wanders the tormented walls of the house in search of a drink. Their reunion is less than tender. Jessica and Martin pick up brother-sister bickering right where they left off. Martin complains about having to deal with fans and relates the adoration of an overly zealous groupie whom he sat next to on the plane. Jessica isn’t impressed and starts in on Martin about his excessive drinking (in a nice move from director John Gould Rubin, Martin literally follows in the steps of his alcoholic ghost father). When Martin asks what his mother’s plans are for disposing of the ashes, she responds that she’d like to have some French toast first then flush them down the toilet. Let’s just say that she just gets even less charming after that, until the arrival of an unexpected guest during the hurricane brewing outside (nice light and sound design by Thom Weaver and Elizabeth Rhodes. I particularly liked a shadow effect following the father as he crept up the stairs). The visitor is Martin’s groupie from the plane, returning his lost Blackberry. The southern drawled, not exactly the brightest bulb in the box (too bad, because the storm forces the power out) Charlotte (Ashley Austin Morris) is invited to stay and dry off, a request that gives sadistic pleasure to Elizabeth and Jessica and torture to Martin as Charlotte reveals information about him from the author's internet fan sites. Soon, the plot takes a number of twists and nothing and no one is as they seemed. Although the twists are fairly predictable, and even over-the-top when it comes to plausibility, this dark comedy still is enjoyable and Tony Glazer is an author on whom to keep an eye. The best part is, that after viewing the Feingolds in action, you’ll question whether or not you can any longer classify your own family as dysfunctional. 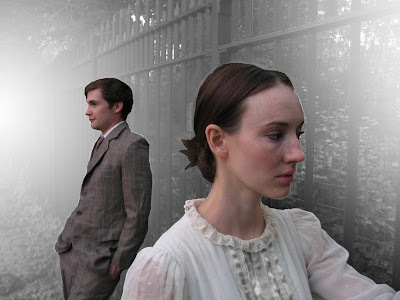 In the Daylight runs through Oct. 11 at the McGinn/Cazale Theatre, 2162 Broadway, 4th floor at 76th St. For tickets phone (212) 579-0528 or visit http://www.vitaltheatre.org/. Not much is known for sure about poet Emily Dickinson except that she led a reclusive life in Victorian-era Amherst, Massachusetts, that she might have had a romance, she wore a lot of white dresses and bucked poetic tradition to write rather depressing, oddly structured poems. After viewing Chris Cragin’s Emily: An Amethyst Remembrance being staged by Firebone Theater Off-Broadway on Theater Row, we know little more. Directed by Steve Day, the drama unfolds backwards in time to explore the life of Emily (Elizabeth A. Davis) and her relationships with those closest to her: brother Austin (Jared Hausman), his wife Sue (Jenny Ledel), sister Lavinia (Misty Foster Venters) and her preceptors Newton and Mr. Williamson (both played by Christopher Bonewitz). All of the actors, except Davis, also play other characters along the way. The time-tripping plot (which isn’t always clear except for dates and scene titles projected onto the set) never gives us any real insight into Emily, however, except that she was rather self-absorbed and uncaring, apparently. Davis, dressed and coiffed just as the stark, plain image you have in your mind of Dickinson (Victoria Depew, costumes) never develops beyond that. Why does she wear white? Why does she retire to her father’s study and refuse to see people, even Mr. Wilkinson? And why does the family tolerate her behavior (Emily decides to move her bedroom into the study, apparently without caring whether her father will object or whether he might be inconvenienced to be put out of his study)? Like punctuation or line breaks that can disrupt the structure of a poem, Day’s choice of stark blocks and a large door for set pieces (Rachel Beckerman, scenic and lighting design) disrupts the play by drawing attention to the constant moving of the pieces by the cast members to create a table, or a bed, or a piano. At one point, Emily hoists the cumbersome door out of it’s pipe-fitted fixture (where it actually plays the role of a door in the center of the stage) to move it to its next incarnation causing us to wonder if one of the many mysteries about the poet might have been that she was a secret body builder. The door doubles as a table, but only sometimes (and doesn't even get to play a door in some scenes, where the actors knock on invisible ones). In one scene, the family gathers around an invisible table. They also chew on invisible hot cross buns. It’s really annoying and at intermission when a member of the stage crew began drilling the box pieces in preparation for their further use in Act 2, I was tempted to offer my services to use a chainsaw to break up that really annoying door. Most significantly, the use of minimal set fails to highlight Emily’s isolation from the world around her. There is no world around her in this production, so she becomes the main focus and such a close up look isn’t flattering. She’s cold and selfish and rather uninteresting. Rolling on a piano, a Victorian sofa and bed and throwing some real buns on a plate would have made her seem less severe. Day also fails to coax the best performances out of the actors. A shawl and a pair of glasses hardly changes Ledel from young Sue into Emily’s mother. Bonewitz resorts to a high-pitched clipped accent to distinguish Williamson from Newton. Interestingly, the scene opening Act 2 gives us a glimpse of what might have been, It’s a comprehensively staged scene in which Austin and Sue marry, followed by their reception. There’s dancing (Kimi Nikaidoh lends some very nice choreography), conversation and a glimpse into these people unencumbered by boxes and doors, and it’s very interesting, but alas, it is too brief. Cragin offers a nice blend of storytelling and Dickinson’s poems, with excerpts sometimes recited by Emily, sometimes by multiple characters, but the production lacks cohesiveness to be able to convey the tale effectively. I really enjoyed, however, the title of scene 4: “The Awe Full Door.” Change that to “awful” and there you have it. Emily plays through Sept. 27 at the Kirk Theater, 410 West 42nd St. For tickets visit http://www.ticketcentral.com/ or by calling 212-279-4200. • FIREBONE THEATRE produces and develops works that explore immortality (fire) and mortality (bone). Their first production was the world Premiere of the play Deadheading Roses by resident playwright Chris Cragin at The Lamb’s Little Theatre in Times Square. 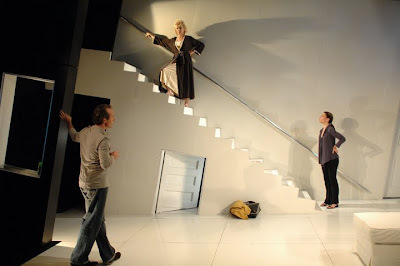 In 2008 they presented the North American premiere of Refuge of Lies by Ron Reed, at Theatre Row. Recently they produced A Mysterious Way, which was performed in a NYC subway station. What a lovely service we enjoyed at last night's 13th annual Broadway Blessing at St. John the Divine cathedral in New York. 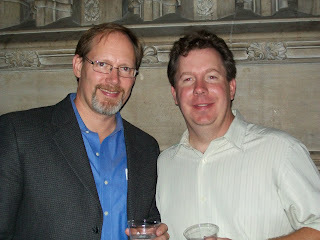 Masterwork Productions, Inc. was one of the sponsors. 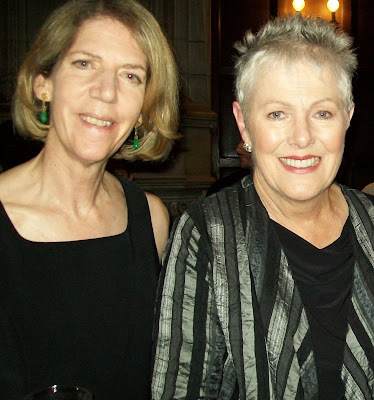 The ecumenical celebration of the new theater season featured thoughts from actress Lynn Redgrave, songs by Broadway's Jean Valjean J. Mark McVey, Carol Hall and Patrice Djerejian accompanied by performers from Project Dance. 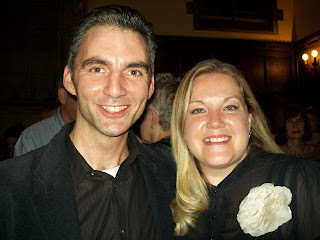 Casey Groves (below left) gave an excerpt from his one-man performance as Father Damian, the Catholic priest who ministered to lepers, and the Broadway Blessing choir performed medleys of show tunes. Bruce Neswick, director of music at the cathedral, played the organ. Rabbi Jill Hausman of the Actors' Temple, The Rev. Canon Thomas Miller, canon for liturgy and the arts at the cathedral, and The Rev. Mittles DeChamplain of St. Clements Episcopal Church officiated at the service, offering prayers, thoughts and a special candlelighting which Miller said represented the light that shines out from and on those in the Broadway community. 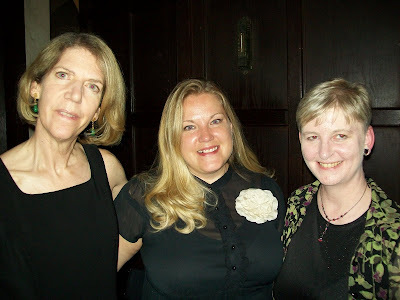 Karen Lehman, (left) Executive Director of the Episcopal Actors' Guild, read psalm 98. McVey (at right with Smith, far right) sang a beautiful song from Christopher Smith's Broadway bound musical Amazing Grace. Redgrave's reflections on surviving breast cancer were very moving. She thanks God for being here for another performance every time she stands in the wings, she said, because God and her faith are an important part of her survival. She concluded with a heartfelt reading of Psalm 23. The event is produced by founder Retta Blaney. Tony Award winner Larry Gelbart, a creative force behind the TV series "M*A*S*H," and movies like "Tootsie" and "Oh, God!" has died. Gelbart won a Tony in 1962 for co-writing the book of the Sondheim musical A Funny Thing Happened on the Way to the Forum. For the obituary, click here. Lynn Redgrave, J. Mark McVey, Carol Hall (pictured at right), Project Dance, The Broadway Blessing Choir and other distinguished guests will be among the performing artists at this year's celebration to ask God's blessing on the new Broadway Season. Masterwork Productions, Inc. is a sponsor of this year event on Monday, Sept. 14 at 7:00 pm in the Cathedral Church of Saint John the Divine. HALLWAYS: The Songs of Carol Hall and Project Dance, whose director Cheryl Cutlip recently was named one of Masterwork Productions "The Lights Are Bright on Broadway" award recipients. 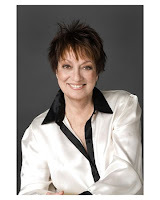 In its 13th year, Broadway Blessing, an interfaith service, was founded by author and theater critic Retta Blaney, Broadway Blessing was conceived as a service of song and story designed to seek God's grace on the new theatre season. The Broadway Blessing Choir under the direction of Bruce Neswick, director of music at the cathedral, will perform a number of Broadway hits followed by a “sing-a-long”. The Very Rev. Dr. James A. Kowalski, dean, and The Rev. Thomas Miller, canon for liturgy & arts, from the Cathedral, will be joined by Rabbi Jill Hausman of Congregation Ezrath Israel / The Actors' Temple and The Rev. Mitties DeChamplain of St. Clement's Episcopal Church as participants in the 75-minute program. Past participants have included Marian Seldes, Marcia Gay Harden, Frances Sternhagen, Boyd Gaines, Edward Herrmann, Anna Manahan, KT Sullivan, Mary-Mitchell Campbell, Tituss Burgess, Kathleen Chalfant, Billy Porter, Elizabeth Swados, Ken Prymus, Three Mo’ Tenors and Broadway Inspirational Voices. Broadway Blessing is free and open to people of all ages; reservations are not needed. For more information please visit http://www.stjohndivine.org/. 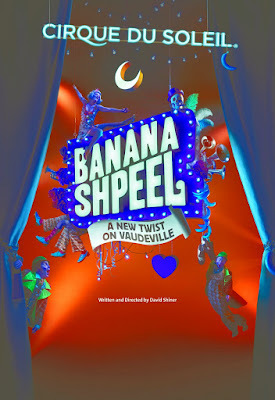 Cirque du Soleil and MSG Entertainment have announced a new theatrical production, Banana Shpeel, to premiere at The Beacon Theatre (2124 Broadway, New York) on Feb. 11, 2010, with preview performances starting on Feb. 4, 2010. Banana Shpeel is a roller-coaster mix of comedy, tap, hip hop, eccentric dance and slapstick, all linked by a narrative that ignites a succession of wacky adventures. This is not circus, or a musical or a variety show, or even vaudeville. It is Banana Shpeel! Propelled by crazy humor and intense choreography, Banana Shpeel plunges us into the world of Schmelky, a cruel and irritable producer who dangles fame and fortune in front of Emmett, an innocent and romantic actor who has come to audition for him. Emmett soon finds himself trapped in a flamboyant, anarchic world where Schmelky sows terror and reigns supreme. Emmett falls in love with the beautiful Katie and meets a bunch of absurd characters, including the strange Banana Man. But who is this mysterious Banana Man and how can Emmett escape the clutches of Schmelky and his henchmen? Banana Shpeel writer and director David Shiner started out as a mime in Paris. His career took off in 1984 when he was discovered at the renowned circus festival Cirque de Demain. Shiner later teamed up with Bill Irwin to create the wordless two-man show Fool Moon, which played from 1992 to 1999, including three Broadway runs. Fool Moon picked up numerous prizes, including a Tony Award, Drama Desk Award and an Outer Critics Circle Award. In 2007, Shiner directed his first Cirque du Soleil production, the big top touring show KOOZA. Cirque du Soleil celebrates its 25th anniversary in 2009. From a group of 20 street performers at its beginnings in 1984, Cirque du Soleil is now a major Quebec-based organization providing high-quality artistic entertainment. The company has more than 4,000 employees from over 40 different countries, including 1,000 performing artists. Tickets are available exclusively to Cirque Club Members and MSG Insiders until Oct. 7, when tickets will be available to th general public. Tickets range from $45 to $120 with a limited number of premium tickets available for all performances. For more information, visit http://www.cirquedusoleil.com/ or http://www.beacontheatre.com/.